This book is for the intermediate grades or a fun read-aloud with the little ones. It is full of facts of all the toughest animals all around the world. It shares fascinating facts like how a crown-of-thorns starfish could be cut up in pieces, and those pieces would grow into it’s very own starfish. The cartoon “sketch” illustrations add to the entertainment. Each page is a new animal and new amazing fact! This informative and humorous look at life in extremes would be great to add to the library for a fun read or even part of an Animals unit in science. This book is a very interesting way to learn about various creatures. It tells about different creatures and how they survive in their environments. It talks about polar bears and penguins to road runners and camels to bacteria that live in different places. The author eventually comes to the conclusion of what the toughest creature on the Earth is. Do you think you know what it is?I really liked this book. Its very informational but interesting at the same time. There are so many different things that this book talks about, but with just about every creature, it mentions the temperatures that the creature can survive in. I think it would be very fun to use this book to talk about temperatures with my students. "I could never live in the Arctic!" That's probably true, because humans are highly prone to freezing in those conditions. However, there are animals that thrive in these such extreme conditions. I loved this book. It was very informative, while being incredible precious. I wanted to read more. I would have this book in my classroom library. It would also be cool to read this book little by little with the class. The earth has thousands, if not millions, of different types of species. They can survive in the coldest of climates to the hottest, and you can even find animals that survive in the deepest depths of the planet. 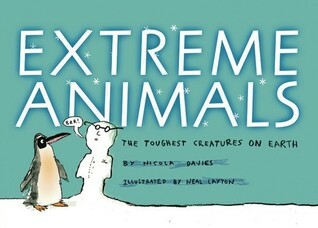 "Extreme Animals: The Toughest Creatures on Earth", by Nicola Davies and illustrated by Neal Layton, highlights some of these unique animals and what they must do to survive in such harsh environments. From the camel to the penguin, he uses humor to and conversational grammar to keep the reader interested. I only wish that the cover reflected the effort within the book because it does not reflect the content inside very well. The title takes up most of the page, and the illustrations are hidden in the corner.This informational book is rather straight forward. Davies takes you on a journey through a vast array of environments, and how is it that certain animals are capable of surviving. Honestly, I was rather astonished at some of the ways animals survive. I was completely unaware that the camel circulates blood through its nose help keep the brain cool under the hot desert sun. The author and illustrator bring humor to a subject that could be categorized as boring by some children, and I feel that is an extremely important to keeping students genuinely interested. The facts used and the way they are utilized provide a nice flow from page to page; it does a fine job of wanting the reader to see what crazy trait the next animal has.As stated, I did not find the cover at all interesting, and I solely picked up the book because I love animals and the living world. It was incapable of keeping me interested for longer than what I needed to read the title. Luckily, the illustrations inside were rich and vibrant enough that it had me carefully looking at each diagram and piece of art to make sure I didn't miss anything. The drawings are not detailed, but they have an appropriate amount of information and tidbits of knowledge that may or may not be mentioned in the text. Drawing focus to the drawings gives the reader a chance to rest their brain from reading while enjoying a bit of laughs. For instance, the illustration of the deep oceanic waters show the food chain with the exaggerated drawings for the different steps in the food chain. It is little additions such as this that keep children interested in a subject that they may normally not find worth their time.In the end, I did not feel this book was worthy of 5 stars because all though it does a great job of bringing scientific information to a child level and drawing in humor, Davies can become rather long-winded in the explanations and descriptions of certain animals. The attention span of the average person is 15-20 minutes, and I am sure a child's is even shorter than that. The grammar might be conversational, but the lengthy paragraphs of information border line on being a textbook in the eyes of a student or child. Category (Informational)Found on page 292 in the textbook1. DescriptionIn this cool book, Davies explains the unique traits of us humans and reptiles. What she does is to use temperature (cold and hot)to convey how the human body can only survive on extremely balanced temperature; for example, 11 degrees added to our internal temperature can literally cause instant death while a 7 degree drop can cause sickness to occur. With everything from bison to whales, Davies certainly covers a lot of ground to keep the reader intrigued. 2. OrganizationAlthough there is no content page, Davies does a great job with introducing the reader to the content on each page. Each set of animals on every page is defined in terms of their characteristics.3. StyleThe reader will notice that each heading is bolded for easy reading and that the font and size fit well and give the reader an informal style to the book; the content seems to be more noticeable. It appears that the style will attract audiences because the book is fun to read while providing educational reading.4. Design/IllustrationsAlthough there are no actual photographs, Davies incorporates the use of cartoon illustrations that are enjoyable to read but also help educate the reader. Each animal cartoon explains what Davies writes on each page; she truly wants the reader to understand the information throughout the book. 5. AccuracyThe information presented by Davies is apparently accurate as the facts can be verified by using any modern reference book. For example, the temperatures discussed on each page and the effects that it can have on animals and humans provide a substantial wealth of information to the reader as it would not be common knowledge. Junior Book LogTitle: Extreme Animals: The Toughest Creatures on EarthAuthor: Nicola DaviesCategory: Informational #1Source: Textbook pg. 292This has been my favorite informational book by far, as it gave the readers tons of information and kept it interesting the entire time. Davies discusses how animals live in extreme environments from Antarctica, Sahara Desert, to even on the ocean floor. She describes these different environments and the adaptation each animal has in order to live in these extreme circumstances. From thick fur, antifreeze, layers of fat, to cooling systems for blood Davies discusses the different ways animals cope with the temperature. She also discusses how long certain animals can go without food or water; it is pretty amazing. It is written so that students will be learning and laughing at the same time. The only change I would make to the writing is that the proper nouns be capitalized, as they should. I think this would be a great book for students to learn a lot from, but it is also important to me that they capitalize the animals they are discussing. Layton did a great job with the illustrations, as they really worked well with the tone of the text. He did a great job at putting the concepts into pictures for the students to better understand and I loved his hilarious captions. I will be using this book in my future classroom although it might be best to look at the book in sections versus in one sitting. Animals live all over the world from the coldest ice floes to the hottest deserts (and even in volcanoes!). Some animals can withstand enormous pressure under the ocean. Some animals can change their temperatures. Some animals can live over 100 years. Learn about all kinds of animals that live life to the extreme in this cartoon-illustrated book. This book provides a collection of facts, certainly interesting and appealing, but not going in depth on any one animal. The cartoon illustrations are amusing, but don't add a lot to the text. The diagrams and cartoon reenactments pretty much restate exactly what the text says. I think a more effective layout would have mixed the text and the cartoons (a la When Bugs Were Big... and others by Hannah Bonner). Still, it's an interesting and amusing book that combines animals with Guinness-record-like facts... a combination sure to appeal to kids. Anyway, I love this book. I mean it. If you have a kid in like 3-5 grade who loves animals, buy this one. It’s filled with truly amazing facts about all kinds of critters, including polar bears, wood frogs, thermophiles and sperm whales. Compared to the other animals, humans are just wimps. And who would have known that the the title for toughest creature would go to one I’ve never hear of before. Of course, you’ll have to read the book to find out what it is. I’ll give you a clue: it starts with a “T” and is really small.The book is conversational in tone, with the facts thrown in. It makes it enjoyable to read, not at all dry. The illustrations are cartoony and funny. It’s learning and fun rolled into one. This quirky book is about all different kinds of neat and interesting animals. The book gives facts on animals that can survive extreme conditions of various kinds due to their physical traits. Each animal discussed connects to the one previously mentioned, and they range from polar bears, to penguins, to hummingbirds, to camels, to reptiles, and many, many more. I think this is such a neat book. It is not only informative, but it is also funny! The there's so many humorous comments and side notes made. The pictures are also funny and simple. I would definitely include this book in my library because I think kids would really enjoy the interactive way the information is presented. I read this book for my junior book reading log. This is an informational book. It is a book about animals that can survive the toughest conditions on Earth, from penguins that survive in the South Pole to bacteria that live inside of volcanoes, Davies' book makes humans look like total wimps! This book is full of factual information but Davies found a way to make it both funny and interesting. The illustrations are cartoon-like and show the information in a way that helps the reader to understand. This is a great book for use in the classroom. Wow! There is so much to admire about this book. This picture book breaks the stereotypical picture book mold of "for young readers only" stigma. I love how Davies weaves complex topics and excellent sentence structure into a book that is readily understandable by novice readers, or could provide depth for informed readers. I particularly appreciated the number of colons and em dashes used in this book. This would be an excellent book to teach conventions among other ideas, like detail, depth, and discovery (but not much alliteration other than my comment). From freezing North Pole temperatures to the inside of active volcanoes, in every area of Earth animals and organisms survive and thrive in habitats humans could never withstand. This informative, entertaining, and humorous look at life in extremes makes science fun for upper elementary readers. Frequent cartoon illustrations in varying sizes break up the text and add interest. Hand this toa teacher whose class is studying adaptations or to a student looking for an interesting topic for a science report--the glossary, index, and amazing facts all make this a terrific starting point. A few intriguing tidbits (such as that the camel’s brain is kept at a reasonable temperature by the blood cooled in the camel’s big nose, and that some frogs can allow ice to grow in their bodies in between cells to hibernate at freezing temperatures), but mostly I felt she didn’t give enough information on any one item, even for younger readers. Also the humorous illustrations were sometimes misleading (for example, the text describes how mammals burn food for warmth, but the picture shows mammals gathered around a bonfire with the heading “mammals burning food”). I found this book while organizing the Dewey section in the media center and I was immediately attracted to the front and back covers. The book describes a myriad of animals, big and small, that live in extreme weather conditions and the adaptations each creature has to live in these environments. The illustrations throughout the book are also very good and explain the text very well. I would recommend this book to 4th and 5th graders. This is a fun science book - with its crudely drawn illustrations and fantastic facts, it is easy to read just a little at a time. We would read a few pages each night, and talk about the fantastic abilities these creatures have to withstand conditions that would kill a human very quickly. I learned something new on every page as well - I've never even heard of a tardigrade before! Our girls enjoyed this book too; it was entertaining and educational. This book is geared toward older students (I would say third through sixth grade) but could be used as a mentor text for younger kids. The funny cartoon-like images are playful when combined with the fascinating text about animals in our world that can thrive in very extreme climates/conditions - both hot and cold. This book is refreshing in the way that students will get a chuckle at some of the captions and illustrations, but will be amazed by the information they're learning, too. A quirky and interesting book about animals that live in extreme conditions, from inside volcanoes to far underneath the ocean. The drawings are amusing, and there's some "low brow" humor throughout that is bound to make children laugh. It explains the scientific facts pretty simply enough for even someone like me -- who has always struggled with science -- to understand. 3/5 stars. I learned some new things! Interesting as a reading for pleasure book. I learned a number of things such as polar bear skin is black - it holds in heat just like a black tee-shirt. Those who like to read animal and science facts will like this offering. As for research, the squooshed layout and sound bites of info are not as appealing for homework help despite the useful index. I thought I'd like this book and I did - the illustrations are invitingly messy (all loose line and scribble) and the subject matter fascinating (what kinds of things live where?). The conversational tone keeps the whole thing solidly in the realm of the weird, while still inundating the reader with all kinds of factual tidbits. Interesting and fun. A different kind of "picture book" in that some of the pictures seem to be a kind of infographic. Great for teaching transitions of the non-traditional kind (really nice hooks when shifting topics). And, of course, with Nicola Davies, we come to expect just-right language and a fun tone in nonfiction. This one doesn't disappoint. Extreme Animals: The Toughest Creatures on Earth shows us just what the title says - and compares them to humans. It was full of interesting, educational science facts and accompanying pictures that give enough information without being overwhelming. I loved the way this book was set up-long and narrow. Very interesting facts about many different animals. Great vocabulary and wonderful illustrations/cartoons etc. The only negative was that the pages had a lot of text on it. It took a while to get to the really fun parts. I love this author's kind of writing. This type of book livens up third graders' animal research by teaching nifty facts that even well-read students won't know. Amazing facts about animals! Well written with engaging cartoonish illustrations. It loses one star for a couple ridiculous evolutionary statements. Nicola Davies Neal Layton - "I was very small when I saw my first dolphin," says zoologist Nicola Davies, recalling a seminal visit with her father to a dolphin show at the zoo. Enchanted at the sight of what she called the "big fish" jumping so high and swimming so fast, she determined right then that she would meet the amazing creatures again "in the wild, where they belonged." And indeed she did--as part of a pair of scientific expeditions, one to Newfoundland at the age of eighteen and another to the Indian Ocean a year later. In WILD ABOUT DOLPHINS, Nicola Davies describes her voyages in a firsthand account filled with fascinating facts and captivating photographs of seven species of dolphins in action. Nicola Davies's seemingly boundless enthusiasm for studying animals of all kinds has led her around the world--and fortunately for young readers, she is just as excited about sharing her interests through picture books. The zoologist's latest offering puts a decidedly quirky twist on her years of experience: POOP: A NATURAL HISTORY OF THE UNMENTIONABLE is a fun, fact-filled guide to the fascinating world of poop across species. "As a zoologist, you are never far from poop!" the writer explains. "I've baked goose poop in an oven with my dinner, looked at bat poop under the microscope, and had my T-shirt stained pink with blue-whale poop. I was obviously fated to write this book. "The exceptional combination of Nicola Davies's zoological expertise and her first-rate children's writing is apparent in her remarkable catalog of award-winning titles. Her first book with Candlewick Press, BIG BLUE WHALE, was hailed by American Bookseller as an "artfully composed study" offering "language exactly appropriate for four- to seven-year-olds and precisely the right amount of information." In ONE TINY TURTLE, Nicola Davies's clear, compelling narrative follows the life of the rarely seen loggerhead turtle, which swims the oceans for thirty years and for thousands of miles in search of food, only to return, uncannily, to lay her eggs on the very beach where she was born. The author's next book, BAT LOVES THE NIGHT, is a tenderly written ode to a much-misunderstood flying mammal, the pipistrelle bat, while SURPRISING SHARKS--winner of a BOSTON GLOBE-HORN BOOK Honor Award--contains unexpected facts about another one of the planet's most infamous animals.When she is not off on scientific expeditions, Nicola Davies lives in a cottage in Somerset, England, where she is lucky enough to have pipistrelle bats nesting in her roof.